Papaya LeavesIP as per our quality management policies which ensure that no compromise in the aspect of quality these are optimal quality products which can be availed at any time on very competitive prices. We are proficiently engaged in supplying superior quality Papaya Leaves which are offered at market leading prices. These are acknowledged for herbal properties for curing numerous disorders and ailments. Due to our widespread distribution circle, we have ably met the requirements of clients. We are manufacturer of Tablets to Increase Platelet Count. we are supplies herbal medicine raw materials. We are engaged in supplying a wide range of Papaya Leaves/Seeds which is long bulbous fruit along with a point at its broad end. Besides, this big fruit has a thin greenish skin that further covers a yellowish orange or to pinkish red colored soft flesh. The center of the fruit is hallow along with black rounded seeds. 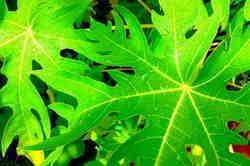 we supply both papaya leaves as well as seeds to our valued clients. In order to cater to the numerous necessities of the patrons, we have been able to provide a wide range of Papaya Leaves.